State officials and the mainstream media have for many years portrayed California as the nation's "green leader,” but a new analysis exposing a correlation between oil industry gifts and California lawmakers' voting records shows a much different California, one heavily influenced by the oil and gas industry. This report reveals that California legislators received $253,771.98 in 2016 in free trips, dinners, and hotel stays from groups at least partly funded by or affiliated with companies from the oil and gas sector, according to legislators’ financial disclosure forms released last week and analyzed by the Energy and Policy Institute, a pro-clean energy watchdog organization. Stop Fooling California, a public education campaign that focuses on the oil industry in California, released the analysis. As you know, I’ve been exposing how Big Oil and the Western States Petroleum have effectively captured the regulatory apparatus in California under the administrations of Governor Jerry Brown and his predecessor, Arnold Schwarzenegger. The connection between so-called "moderate” Democrats and Big Oil gifts is the latest example of how powerful an influence Big Oil exerts over politicians and regulators in a state that some have called the “greenest” one in the nation. The analysis shows a correlation between higher gift values from Big Oil and friendlier votes from so-called “moderate democrats,” i.e. Oily Dems. 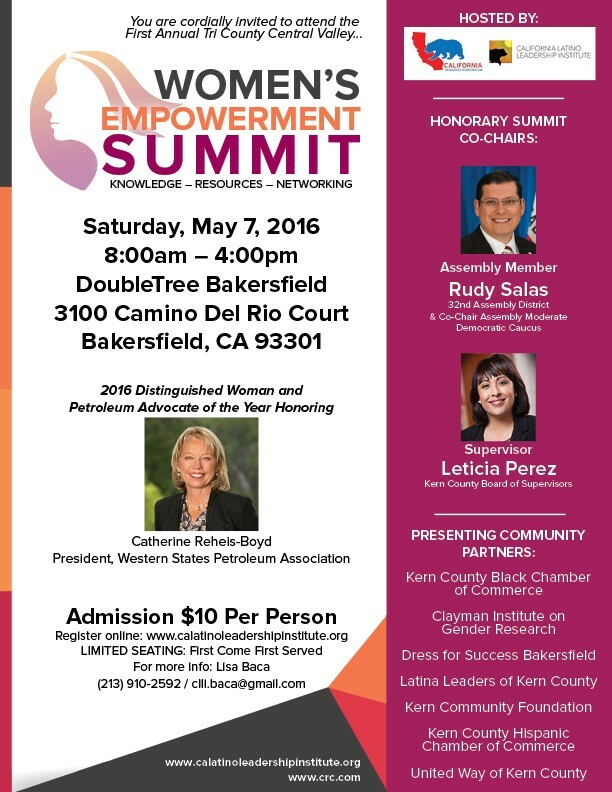 It is revealing that Assembly Member Rudy Salas, the honorary co-chair of the “Women's Empowerment Summit” on May 7 of last year, received the most oil industry gifts, $24,549.33, of any legislator in 2016. In a salute to California’s status as the third largest oil state in the country and Big Oil’s role as the most powerful corporate lobby in Sacramento, the "Women's Empowerment Summit" co-chaired by Salas honored Catherine Reheis- Boyd, President of the Western States Petroleum Association, with the 2016 "Distinguished Woman and Petroleum Advocate of the Year" award. The event in Bakersfield, sponsored by the California Latino Leadership Institute, was billed as the “First Annual CLLI Tri County Central Valley Women’s Empowerment Summit." The corporate sponsors for the event included the “headline sponsor,” the California Resources Corporation (formerly Occidental Petroleum), along with Aera Energy, the Chevron Corporation and SEIU 521. After giving the award to Reheis-Boyd, it is no surprise that the Western States Petroleum Assocation paid $1,600 for Assemblyman Salas to attend its annual conference on October 4, 2016 at the Ritz Carlton in Half Moon Bay. California’s legislators received $253,771.98 in 2016 in free trips, dinners, and hotel stays from groups at least partly funded by or affiliated with companies from the oil and gas sector, according to legislators’ financial disclosure forms released last week and analyzed by the Energy and Policy Institute, a pro-clean energy watchdog organization. Stop Fooling California, a public education campaign that focuses on the oil industry in California, released the analysis. From 2012 to 2016, the oil-affiliated groups gave legislators gifts with a value of $1.24 million. The total value of the gifts from oil-affiliated groups doubled from 2012 to 2015, before dropping back to 2013 levels in 2016. The data for the analysis came from the California Fair Political Practices Commission, which mandates disclosure of gifts to public office holders. The California Independent Petroleum Association (CIPA), a trade association for oil companies, paid for the meals and hotel for 12 legislators at a “symposium” in Newport Beach from December 8th to 9th. The legislators were Thomas Berryhill (R), Kansen Chu (D), James Frazier (D), Cathleen Galgiani (D), Christopher Holden (D), Patrick O’Donnell (D), Sebastian Ridley-Thomas (D), and Blanca Rubio (D), Steven Choi (R), Vince Fong (R), Rudy Salas (D), and Thomas Berryhill (R). The California Issues Forum (CIF) feted eight legislators, all Democrats, with a hotel room, meals, and transportation to Napa, California. CIF’s funders include Chevron and other oil companies, and it focuses on influencing moderate Democrats on behalf of corporations. The legislators were Autumn Burke, Jim Cooper, Jim Frazier, Mike Gipson, Adam Gray, Rudy Salas, Freddie Rodriguez, and Timothy Grayson. The Western States Petroleum Alliance (WSPA), regarded as the most powerful voice for California’s oil industry, paid $1,600 for Assemblyman Rudy Salas (D) to attend its annual conference on October 4th at the Ritz Carlton in Half Moon Bay. Salas was the top recipient of gifts from oil-affiliated groups in 2016. The Independent Voter Project, which receives funding from oil companies including Chevron, spent an average of about $3,000 per legislator flying, hosting and feeding nine lawmakers at its infamous annual Maui conference, as reported by the Los Angeles Times. The legislators were Jim Cooper (D), Mike Gipson (D), Reginald Jones-Sawyer (D), Freddie Rodriguez (D), Tom Daly (D), Joes Medina (D), Miguel Santiago (D), Thomas Berryhill (R), Cathleen Galgiani (D) and Franklin Bigelow (R). To discern whether the gifts are correlated with more pro-oil voting patterns, the Energy and Policy Institute analyzed the value of the gifts received by so-called “Moderate Democrats” who have voted with the oil industry’s interests, as well as those Democrats who did not, over the 2012 - 2016 period.